Has anybody considered using the little flash that Pentax sells as a wireless flash controller with the bonus that it's small and can be stuffed in a photo bag for emergencies? I'm talking about the new Pentax AF 201FG Flash or the older Pentax AF-200fg flash. Since there is no built in flash with the K3 II we lose the wireless functionality. Rather than buying two of those electronic controllers, it might be more pragmatic to get one of these little flashes. They are cheap, serve as a flash when you didn't expect to need one and will allow the wireless function on my 540 flash to work like it did with my K-5. I started to think of this because I really don't want to buy the electronic controller and have two more gadgets and probably a need for eight more batteries. I noticed a used AF-200fg flash being sold locally. Has anyone tried this as a controller? It should work as far as I can tell. Is there a problem with my logic here? Also has anyone else noticed that Pentax upgraded the little 200 flash? I wonder if there are other improvements besides bounce. 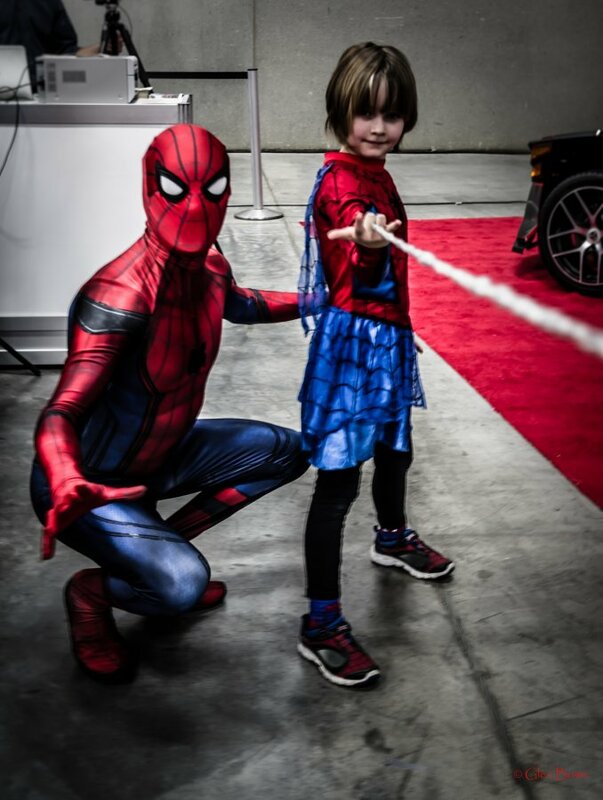 I started to think about this again because I was at a local Motorcycle Show and I tried to photograph a famous child who became Spider-Mable for a day compliments of the Children's Wish Foundation. She was very active and my K3-II let me down because the ISO was locked on 100. My bad for not checking it but the fix was to pull the lens off and put it back on again. I didn't realize the problem until I got home. However, if I had a little flash in my bag I could have made the image work. As it is, I had to do some major touch up on one of the 10 images to make it plausible as a keeper. I'll upload it for interest but it's not really relevant to the question. I didn't think it could act as a controller. Cheap radio triggers are all the rage these days. The flash master and controller P-TTL feature is missing from all flashes Pentax makes except for the AF360FGZ (1 & 2) and AF540FGZ (1 & 2). Dumb wireless slave mode S1 or S2 can be triggered by any flash. What is really needed is for Pentax to have a small add on light packaged with the K-1 and K-3ii that ties directly into the camera menus like the pop-up did and offers master/controller functions while on those cameras. In the meantime consider the flashes you mentioned or grab an AF201Sa cheaply on eBay. They offer a basic auto thyristor mode and have the same form factor. They are also dirt cheap. On program they can set f stop for you and shutter speed. I have one and won't get rid of it just in case I ever need a pop-up alternative. I have the Pentax AF 201FG Flash and it will not act as a wireless controller for P-TTL. I don't think the 200Fg does either but I don't own so i have no experience with it. I use the Pentax AF 201FG Flash with an off camera flash cord on the K-S2. You could use it to set off an off camera flash in Servo mode and then you need to be doing all manual flash work. I didn't realize that the little built in flash was so capable. It would act as a controller for my 540 flash wirelessly. I gather than the 201FG can't do that but I don't understand why not as it just has to be able to send those high speed or high frequency flashes that the 540 can receive and therefore work off camera. I thought that since the built in flashes are the most basic of all, any added flash would do that task and more. I'm glad I checked here first. I don't use a flash often but I'll sure miss the easy wireless capability that my K5 had with the 540 series flash. All times are GMT -7. The time now is 09:56 PM. | See also: NikonForums.com, CanonForums.com part of our network of photo forums!